Termite.com.au Consumer Guide to Pest Control Services in South Australia - learn about destructive termites in Port Lincoln SA region - other pests in Port Lincoln SA region - recommended termite control methods - the safer more effective pest control products - pesticide safety issues - consumer protection advice AUSTRALIAN PEST CONTROLLERS ASSOCIATION INC.
Termites infiltrate Port Lincoln homes - will Yours be next? 1 in 3 homes - recent industry surveys suggest about one in three of homes in South Australia will suffer a termite infestation - actual figures for the Port Lincoln SA region may be higher due to the highly destructive local termite species - other local environmental factors favouring widespread termite colony development - and the type of construction of buildings in the Port Lincoln region that allow undetectible termite entry into the wall and roofing timbers. Fortunately the new hi-tech termite control products from USA - Termidor and Premise termiticides are now available in SA which offer 100% termite protection in the vast majority of situations. Subterranean termites are known to attack buildings in the Port Lincoln SA region and cause severe damage to roofing and wall framing timbers within a few months of the initial infestation. 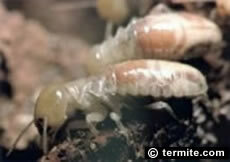 Termite control options aim at exploiting certain behavioural characteristics of subterranean termites in varying types of building construction and environmental situations - click here for info on termites in the Port Lincoln SA region. FREE - FUMAPEST Spider Identification Chart with FIRST AID spider bite procedures - a ready reference guide in full colour of dangerous and venomous spiders that commonly occur in the Port Lincoln SA region.